Friday night will be mostly cloudy, with lows in the 20s and 30s. Saturday the clouds will continue, with spots of rain and snow showers. Highs will be in the 40s. 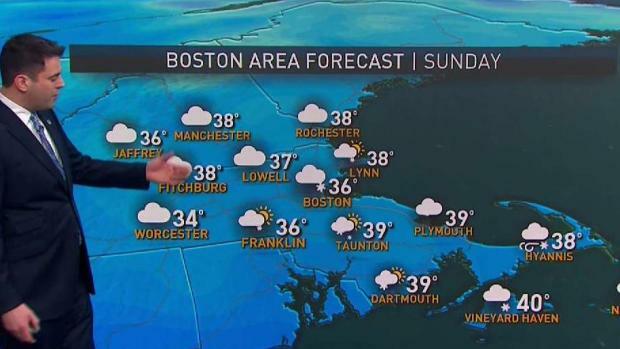 Sunday will be mostly cloudy, with a few snow showers. It will be another cold day, with highs in the 30s and 40s. Cool air isn’t going to leave New England anytime soon. In fact, it’ll build stronger into the region. And it looks like some light snow is possible for some areas this weekend. Friday’s high temperatures climb into the 40s for many of us, nearing 50 from Hartford, Connecticut, to Providence, Rhode Island, but the storm that buzzed by New England yesterday after slamming the Mid-Atlantic and New York City is still sitting over Atlantic Canada, and it’s large enough and strong enough to continue having an impact on our region. One disturbance is sliding overhead Friday and delivers building clouds with flurries and sprinkles this afternoon — some of which will continue in the Green Mountains, northern Berkshires and northwest facing slopes of the White Mountains overnight with a light accumulation. Saturday dawns with a north wind and cold air — that combination may blow some ocean effect snow showers off of Cape Cod Bay onto the Cape Saturday morning while the rest of New England sees more clouds than sun and highs in the lower 40s ahead of another disturbance sailing through the sky above Saturday evening. 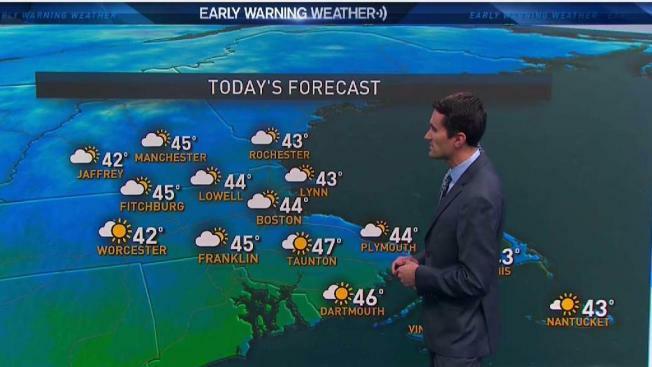 Sun to clouds, chance flurry late. Highs in the 40s. Overnight Friday: Mostly cloudy. Lows around 30. Saturday: Morning snow showers on Cape Cod, clouds and sun elsewhere; evening and night snow showers. Highs in the 40s. Sunday: Cloudy, chilly with flurries. Highs in the 30s. From Saturday evening through night, the combination of atmospheric energy aloft and a developing northeast wind will crank up some snow showers in eastern New England — from Maine and central/eastern New Hampshire through Boston and Cape Cod — for accumulation of a coating to two inches, mostly on the grass. A continued onshore wind Sunday means a raw feeling with snowflakes continuing to fall from time to time. The sky clears Monday, but cool air lingers until the next storm system draws slowly closer Wednesday through Friday, gradually raising temperatures and bringing a slow increasing chance of rain showers in the exclusive Early Warning Weather 10-day forecast.